Whether you're living in a tiny apartment or a tiny house, making the space functional can ease stress and keep your home tidy and organized. The problem is that a lot of storage furniture is bulky. If you are already running low on space, big furniture isn't going to help much. Instead, you may need to look for some more creative solutions. 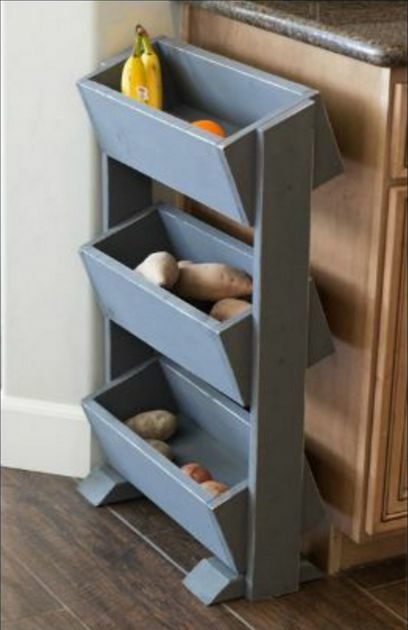 Creative storage doesn't have to be ugly or boring either! These charming solutions are fun, attractive and functional. Check out a few of these ideas to save space in your small home. 1. 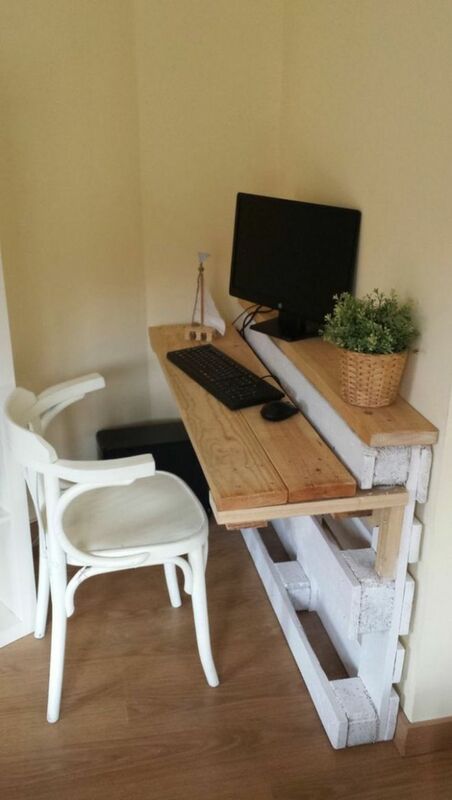 Pallet desk, seen on Pre Nons Le Temps. If you don't have a spare room for office space, no worries. Ditch the kitchen table for this adorable pallet desk. Making use of a reclaimed pallet and a few two-by-fours, this desk takes advantage of tucked-away space that may otherwise collect clutter. The basic desk is frills-free but there's enough room to get the job done. 2. Affordable DIY produce rack, by Over the Big Moon. If you eat lots of fruits and veggies, traditional produce baskets are probably too small to fit your needs. This fun storage option takes advantage of storing up, with several deep baskets in a thin frame. Tuck this easy-to-build option against your kitchen cupboard so it's out of the way. You can make this yourself with two taller piece of wood and a few wood planter boxes. 3. 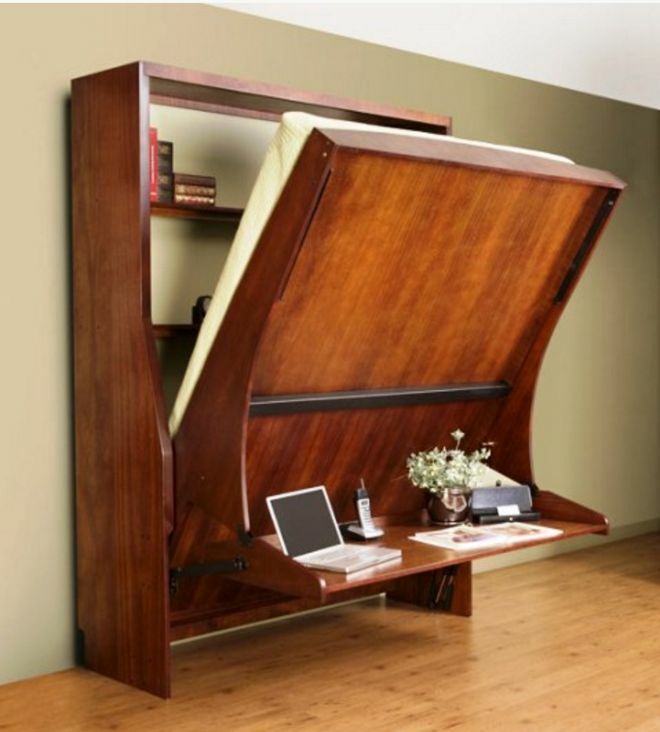 Murphy bed with integrated desk and shelves. The Murphy Bed is a classic storage solution. Simply flip the bed up when you're ready to use the extra floor space for visitors. This unique twist includes shelf space above the bed and underneath. When you flip the bed up, you can pull down a desk surface. This is perfect for hidden work space, you can tuck away at the end of the day. 4. Slot sofa, by Matthew Pauk. 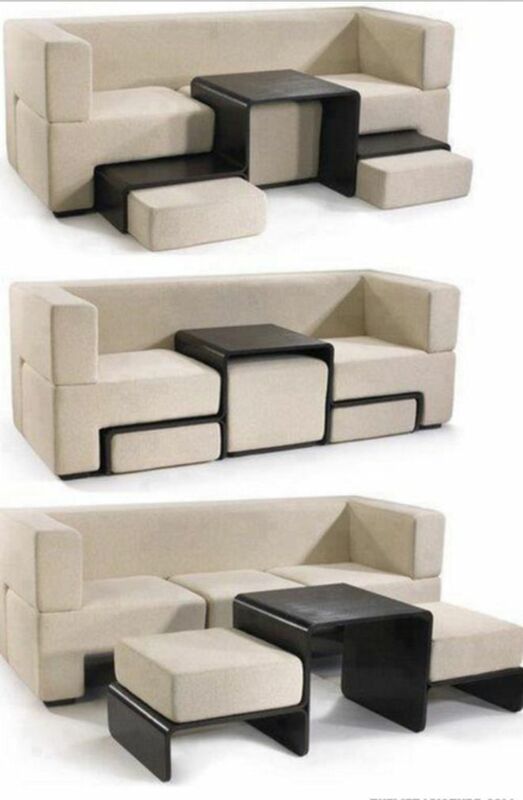 Quite possibly one of the most unique storage solutions, this fun sofa lets you create more seating win a snap. Simple slide the table/seating area out when you need it and tuck it back between the cushions when you don't. When it's stored away, you can still access the table-top surface from the seat on your sofa (a perfect solution for holding your treats during a movie marathon.). 5. 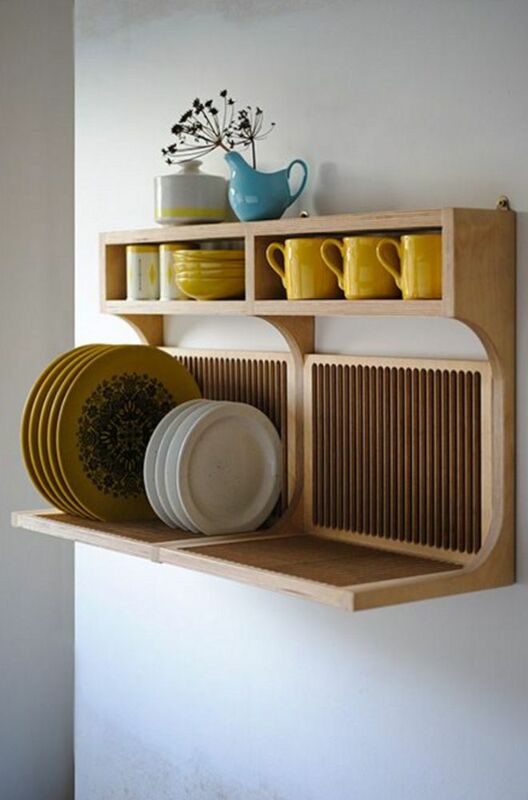 Made to order kitchen storage and drying rack, by Setyard. One of the simplest tricks to adding more storage space to your home is to make use of otherwise unusable space (like a small piece of wall). This cool storage and drying rack is made to order so you can make it to fit your space. This creative option will keep your dishes within easy reach, and free up some much-needed cupboard space for other items. 6. Dining table with integrated shelving and storage, seen on EBay. 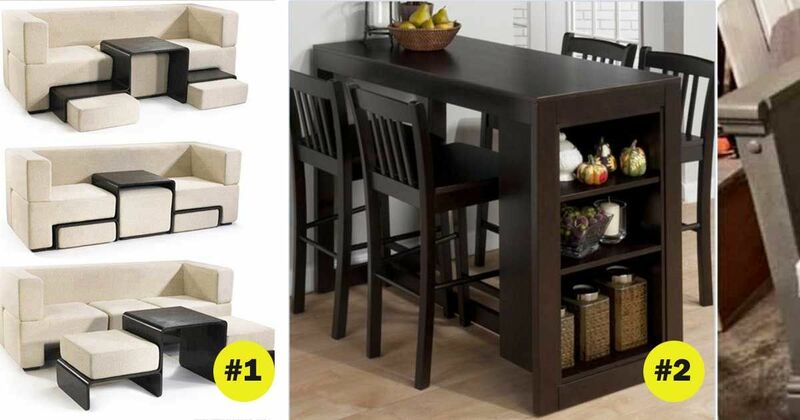 If you need to take up floor space, aim for dual-purpose furniture for added functionality. 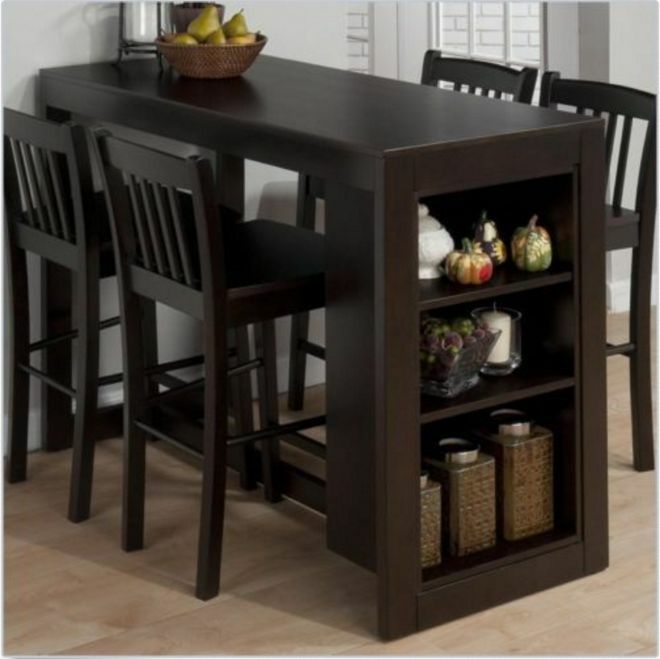 This dining table is not only attractive, it also offers additional storage options. You can store spices or your cookbooks on the built-in shelves or a truly unique look that is both practical and fun. The shelves are deeps, so you can safely fit some bigger items on them. 7. 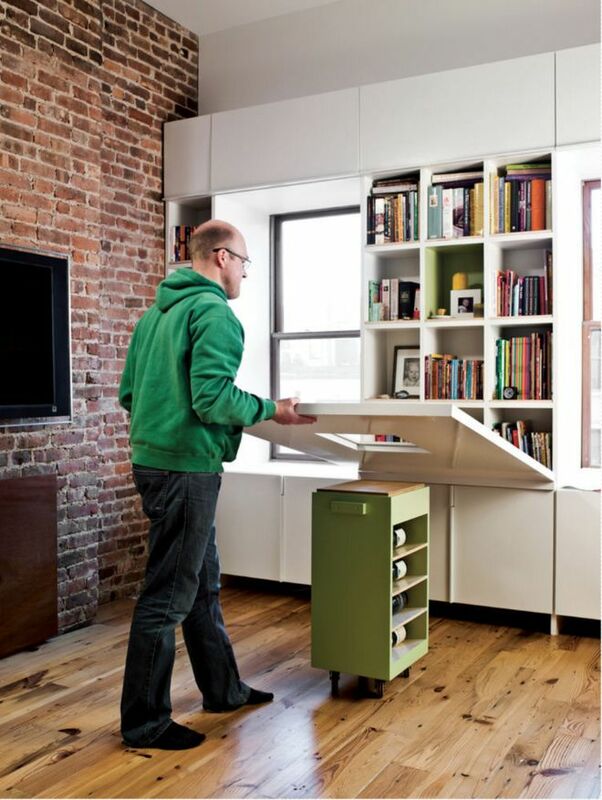 Bookcase with folding desk, seen on Dwell. Book lovers beware. This fun idea takes advantage of two space-saving ideas. First, the movable kitchen cart offers additional counter space, but can be hidden away when needed. The second is this fold-down, Murphy-style table. It folds up to create a cool window to your books. 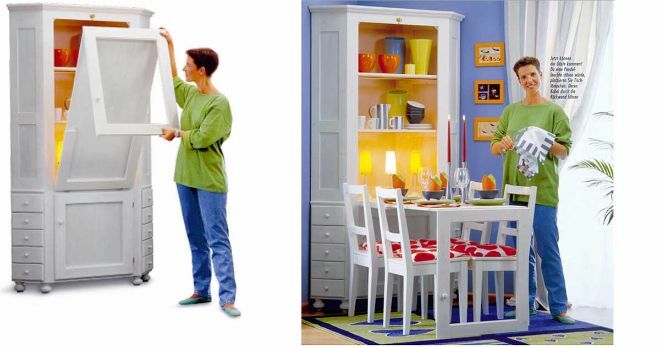 When you need dining (or desk) space, fold it down over the kitchen cart for a functional, large table area. 8. DIY dresser makeover, seen on Ashley Dalton Porteus' Facebook page. This fun storage solution takes advantage of reclaimed wood. Turn an old dresser into a functional and attractive place for getting your shoes on before work and school. Say goodbye to entryway clutter with this fun DIY project. This storage compartment keeps shoe clutter at bay with the functional storage boxes underneath. Keep your keys and mail at hand with the built-in drawers. 9. Corner cupboard that doubles as dining table, by Selbst. This clever cupboard space doubles as a kitchen table. Simply fold the table up and out of the way when dinner is over. The large built-in shelves are a great place to store extra dishes or dinnerware out of the way. The table folds down in just a few seconds so you can entertain and feed your family quickly. 10. Bed with storage and play table integrated, by Great Little Trading via House. Kid's rooms are notorious for attracting clutter. This fun storage solution provides both a play area and storage for toys in one simple container. If you need to contain a bunch of little toys, this drawer may be the perfect solution. 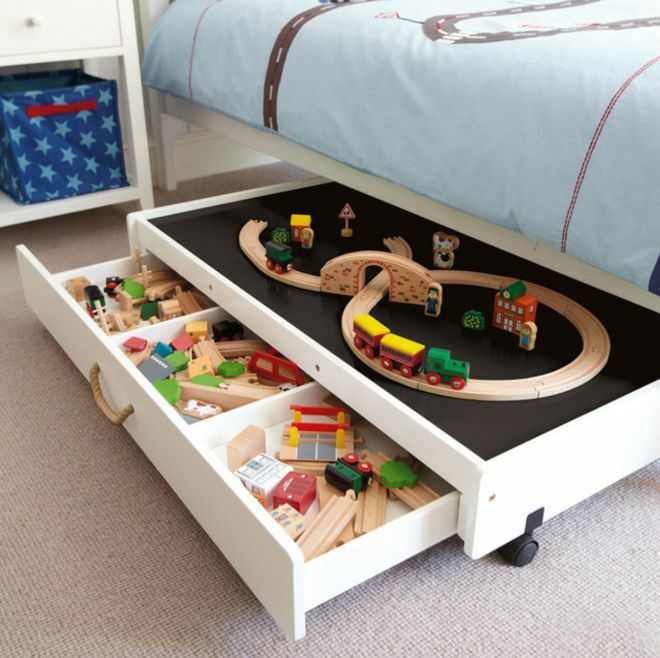 The storage drawer slides under the bed, so you can free up even more floor space for running around. What are your favorite ways to save space in a small home? Share your tips in the comments below. Whether you work from home full-time or just need a place to check your emails once in a while, having a desk in your home is almost a necessity. There are a ton of amazing options out there; here are 8 of the best!